Napoleon and Illya entered the only room they could find for the night. After escaping Thrush and destroying their headquarters, the room might be cheap but it was out of the way and clean. Spotting the twin beds, each headed toward their side of the room to check for anything that could be dangerous to them. Although he couldn’t wait to get the blood and dirt off himself, he knew that Napoleon had gotten the worst of the treatment this time. Accepting the offer, Napoleon disappeared into the bathroom and a shower. The hot water loosed his sore muscles and helped ease the pains from the torture. Drying himself off, he headed for his bed. “Your turn. By the way, that was a nice entrance and rescue. I doubt Thrush knew what hit them.” Napoleon lay back on the bed picking up the TV guide from the table between them and began leafing through it. “With their security thinking I would be sneaking in to liberate you, I figured they would not expect the straight forward attack,” the Russian had thrown off his clothes and headed toward the bathroom. “Next time someone makes fun of you gymnastic skills, just show them one or two of the moves you made tonight. They won’t be laughing afterwards.” The American called after him. Napoleon heard Illya singing over the running shower. His partner only seemed to sing when he was happy with his performance and today he had every right to be proud of himself. His timely rescue came just as the interrogator was beginning to get very creative in his method of questioning. Napoleon leaned back browsing through the guide until he found a movie that sounded interesting. Napoleon rose slowly to turn on the television. The movie, Postcards from the Asylum was just starting as he climbed back into bed. Plumping up his the pillow, he sat against the headboard. He was so engaged in the movie that when his partner stood in front of the set it surprised him. “Oh no you do not. I am tired and want a good night’s sleep. Every time you watch a scary movie right after an interrogation it gives you nightmares.” he scolded turning the set off. “I happen to like this type of movie. Now please turn it back on and move out of my way; the good part is beginning." “We have nightmares all the time from our work so what’s the different. “I see no reason to induce additional nightmares, besides these movies are all silliness. I find our real life gives me enough nightmares to last a life time.” Illya countered turning the set back on before lying down. Within a few minutes, Napoleon heard the easy breathing of his partner letting him know his partner had fallen asleep. Napoleon had to admit the movie was cheesy but he enjoyed being scared without the danger of being tortured. Finally the hot shower and half way decent bed allowing him to snuggle down into the covers and relax while watching the show. He laughed at the antics of the hero who opened doors knowing something was behind them, went into a dark rooms although he could hear heavy breathing, and was sure he could defeat any dangers he found. A small grain of recogniition suggested he enjoyed the hero as it reminded him of what his job involved. Next thing he knew, the hero was racing down a corridor of the dark asylum with crazed patients trying to kill him. Knives and guns were in their hands, although there was no explanation as to where they came from. But then Napoleon began to recognize that the maniacs were dressed in Thrush uniforms wearing the typical beret. As the light began to brighten, the face of the hero became clear. Stunned Napoleon recognized the face as his own. Confused he tried to remember how he had gotten here but couldn't remember entering the corridor. A piece of paper hit him on the head, followed quickly by others. Soon the single pieces of paper became a steady flow. Slipping and sliding he continues to run. The steady flow of paper became an avalanche. The maniacs were catching up to him while the paper was slowing him down and burying him until only his head and one arm was free. Li fting one of the sheets, he saw it was a postcard. 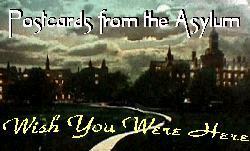 On it was a picture of spooky looking buildings and the sayings Postcards from the Asylum---wish you were here. He felt closed in and was unable to move. As the falling cards covered his head, Napoleon began to yell for his partner. The mound of paper covered him muffled his voice. Yelling louder, he heard a voice calling him. Moving quickly to his partner's demand, Napoleon attempted to pull his gun out from under his pillow and roll off the bed expecting trouble. Instead he was complete wrapped up in his covers and unable to get free falling on the floor. "That is it. You fell asleep watching a movie on again," Illya gave him a look that said listen well and that this warning to heart. "No more scary movies while we are out on assignment. DO YOU UNDERSTAND?" "How do you know it wasn't an assignment related nightmare?" Napoleon asked innocently. The look he received from his partner left not doubt that following that line of excuses would result in some physical damage. "I am tired and need sleep. I want to hear nothing more about an asylum, inmates, or postcards. Do I make myself clear?" Napoleon nodded. It wasn't often his part let his anger show through about something Napoleon had done, but when he did it wasn't a good idea not to challenge him. Unable to fall back to sleep until his heart stopped racing, Napoleon picked up the TV guide again leafing through it.